Lubrication is the prime need for all moving parts. It reduces the frictional losses and increases the efficiency of the machine. In an oil-free air compressor, lubrication is required in running gear only. A running gear is an assembly of various parts as like crankshaft, connecting rod, main bearing etc. Non-Lubricated compressors are fitted with the cylinders which don’t require lubrication. The Teflon Piston Rings take care of lubrication in oil-free air compressor. Here I will like to share the information on how to carry out lubrication in reciprocating air compressor so you can better maintain your valuable engineering utility. An oil pump is used to pump-up and increase oil pressure from the crankcase sump. This positive displacement rotary pump is driven by the crankshaft through an oil pump drive shaft. The oil pump draws oil from the frame sump through a fine perforated sheet strainer. 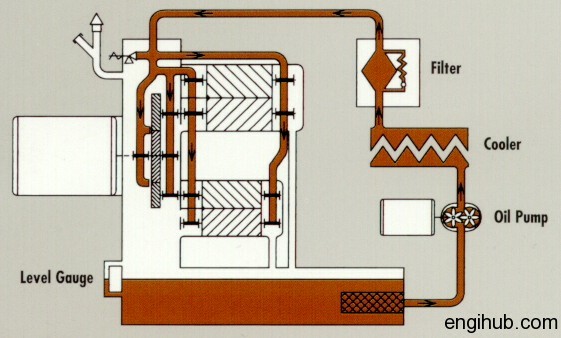 Oil pump discharge is taken to the cartridge paper type oil filter. The filtered oil through the copper pipes is led to each main bearings, drive end and non-drive end. The oil from main journals of the crankshaft flows to crank pins through the rifle drilling holes. And also from crank pins to small end pins through rifle drilled hole in connecting rod. Facing belt wheel, having a clockwise direction of rotation, the left-hand cross slide that is fitted towards first stage or low-pressure stage is pressure lubricated. A copper tube connection is taken through a tee connection in main oil line and connected to a choke. This is fitted on the top face side of the cross slide. The lubrication oil through the choke flows to the centre of the cross slide to the top of the crosshead. The cross slide and crosshead fitted towards the second stage or high-pressure stage is splash lubricated in a case of HX models. Since the direction of rotation is clockwise when viewed facing the belt wheel, the splashed oil from the second stage connecting rod bearing falls on the top of the cross slide. The top of the cross slide is specially built with all around a small dam in which the splashed oil accumulates and through the drilled hole, falls on top of cross head for lubrication. In a case of HN Model, which has higher capacity than HX Models, the second stage cross head is lubricated through the choke with separate lube line.